This sticky thread is meant to address the common question of how to place images inline in your posts (trip reports.) The vBulletin software comes with some instructions in the FAQ, which can be found under "Attachments and Images". I further included "How to embed images from photo hosting web sites like Picasa". Note that inline images are turned off for the Trail Conditions forums. Full Trip Reports with inline images belong in ... you guessed it ... the Trip Reports forum. Last edited by bikehikeskifish; 02-07-2013 at 07:41 PM. 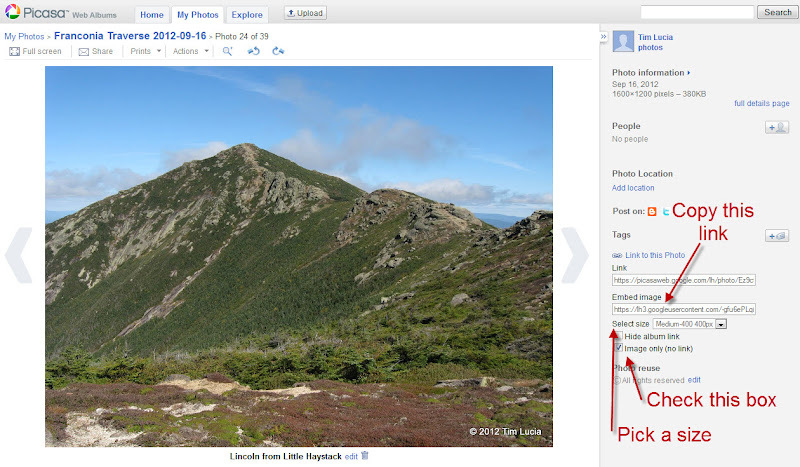 One day, I was walking along the Franconia Ridge Trail when I came to Little Haystack. The view back to Lincoln is one of my favorites. Blah, blah blah blah blah. Blah, blah blah blah blah. Blah, blah blah blah blah. Blah, blah blah blah blah. One day, I was walking along the Franconia Ridge Trail when I came to Little Haystack. The view back to Lincoln is one of my favorites.